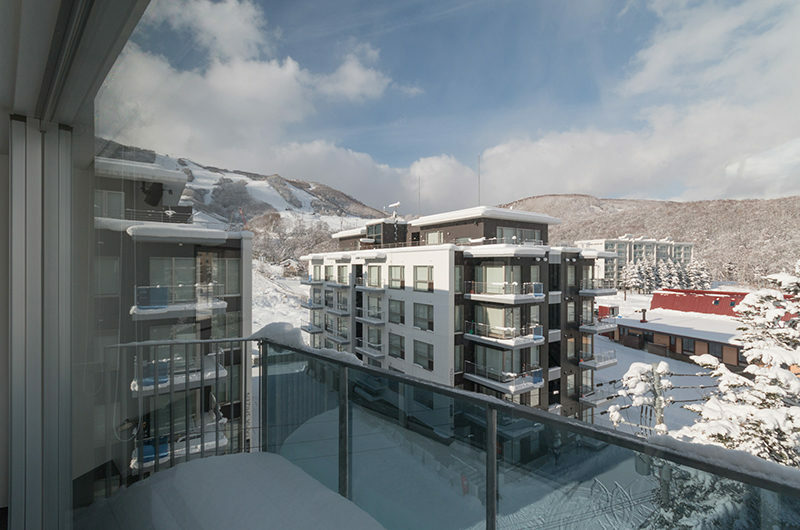 Kira Kira Niseko brings you modern comfort and all the convenience of city living within walking distance of lifts, entertainment, shopping and dining. 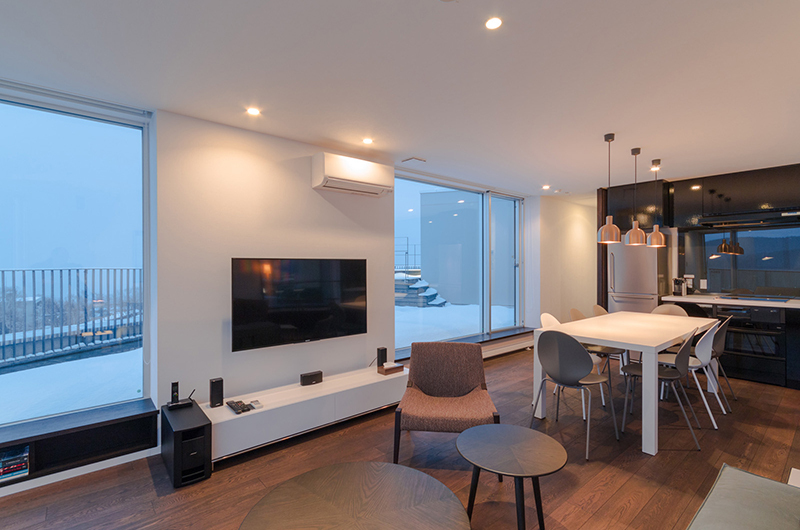 There’s an apartment option to suit every travel party, with Studio, 2-bedroom and 3-bedroom aparments, and a newly refurbished 3-bedroom penthouse across two floors. 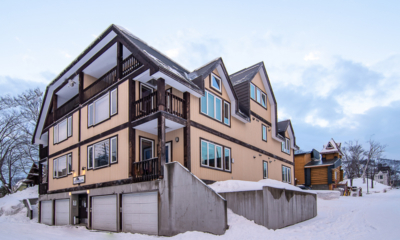 To make the best of your slope time not only are extensive ski locker and dry room facilities provided, but staff are also on site to help you during your stay and shuttles are provided to take guests straight to the hill and back. 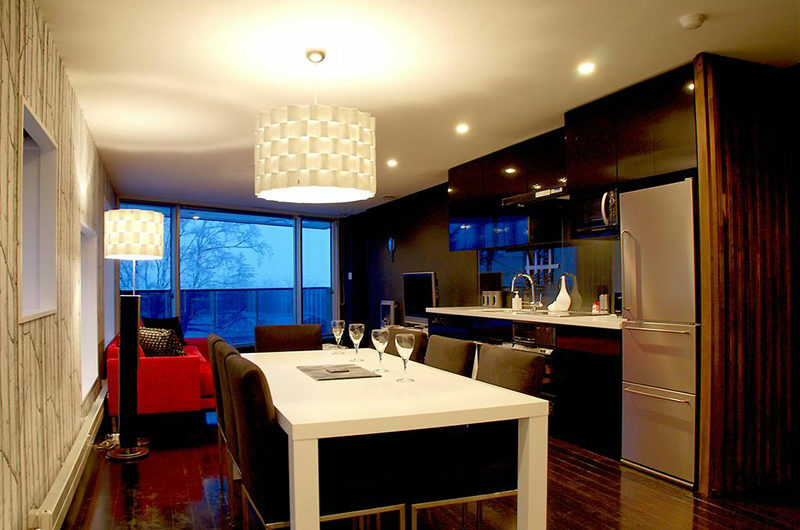 Class and convenience in one stylish package! In all apartments but the penthouse, red sofas make a sharp contrast to walls and fixtures either in either black, white or with striking designer wallpaper that brings the muted tones of winter indoors. 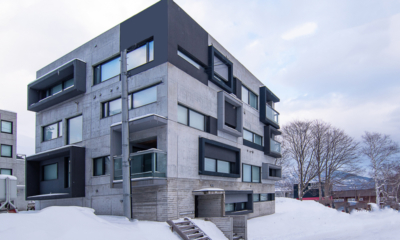 Each apartment from Studio upwards features its own balcony either facing down into the village, or up towards the ski slopes. 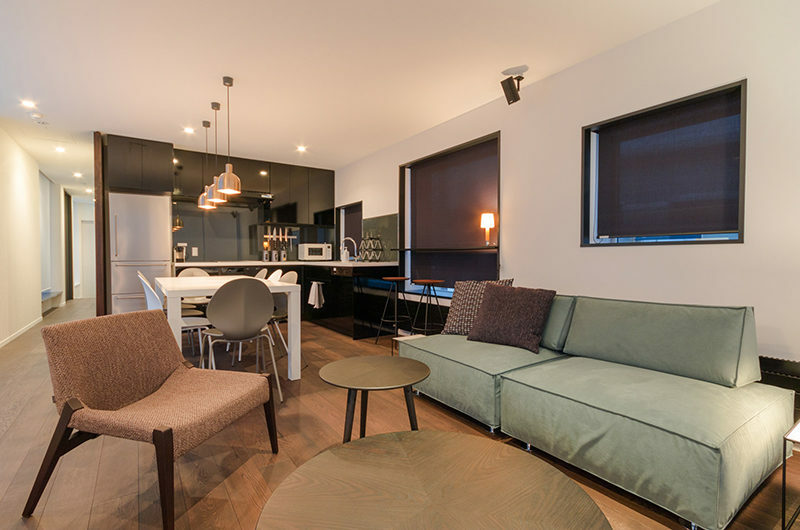 All apartments feature fully equipped kitchens and ample cooking space – a rare find in Hirafu where smaller rooms will be hotel-styled. Though some of the nearby high-rises will partially block your view, every apartment has a contained balcony space and windows to more than one side of the building, so you will catch glimpses of either the village, ski hill, rolling hills or Mt Yotei depending on the room. 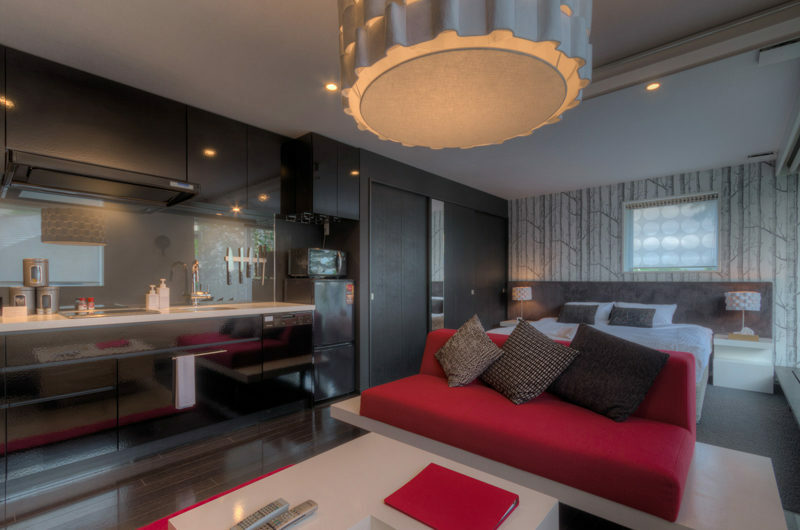 A fantastic bonus of staying at Kira Kira is that it includes a private guest shuttle to take you to the ski lifts or anywhere around the village from 7.30am to 7.30pm. 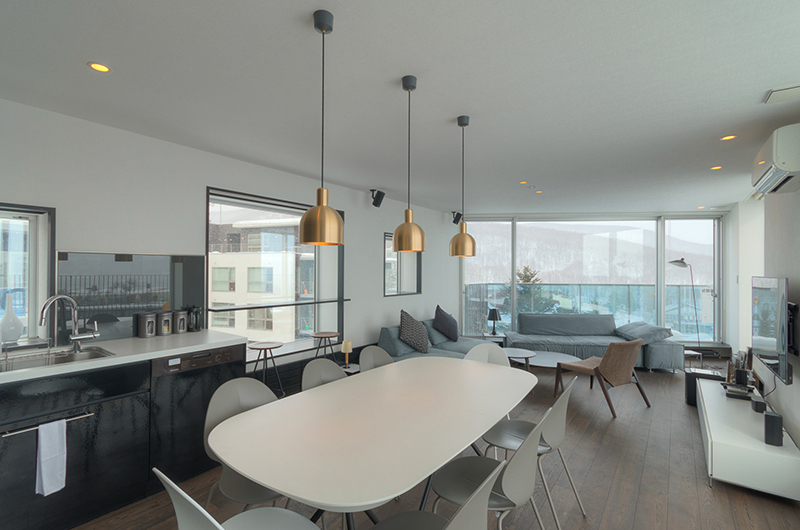 With Kira Kira the whole wish list is here – location plus VIP transport, space for entertaining, a perfect kids room and comfortable living space everyone can enjoy. 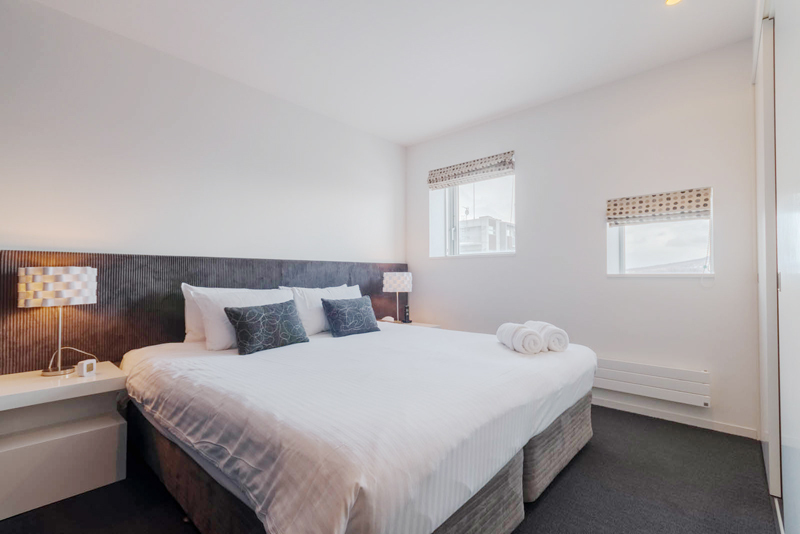 Ranging between the second and fourth floors, the studio apartments are roomy and well-appointed with all the little touches you require for a comfortable, cozy stay – great for couples. * Extra guest child only. 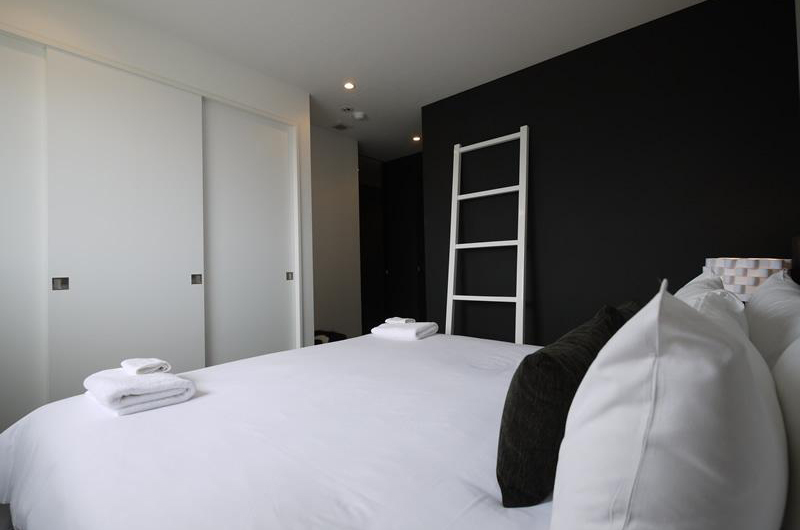 Located on the 5th floor, with great balcony views across town and bedrooms secluded from the open-plan living space. 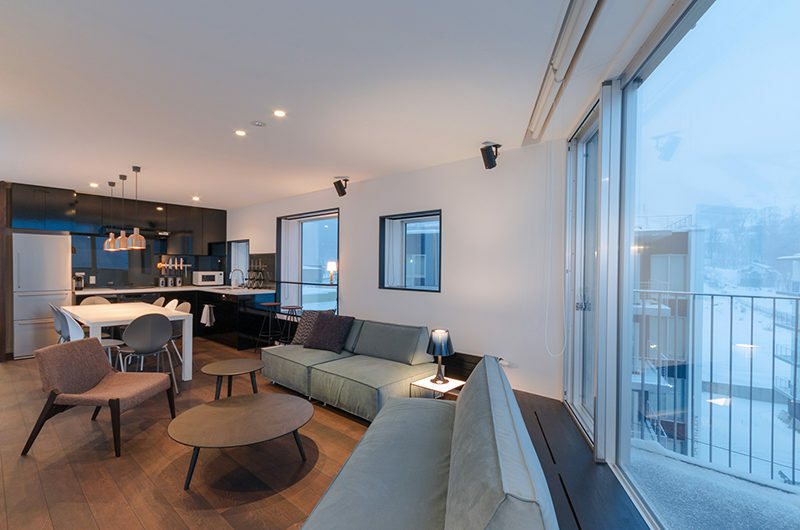 Expansive living area with views across the village – great room arranangement for travellers with younger and older children. 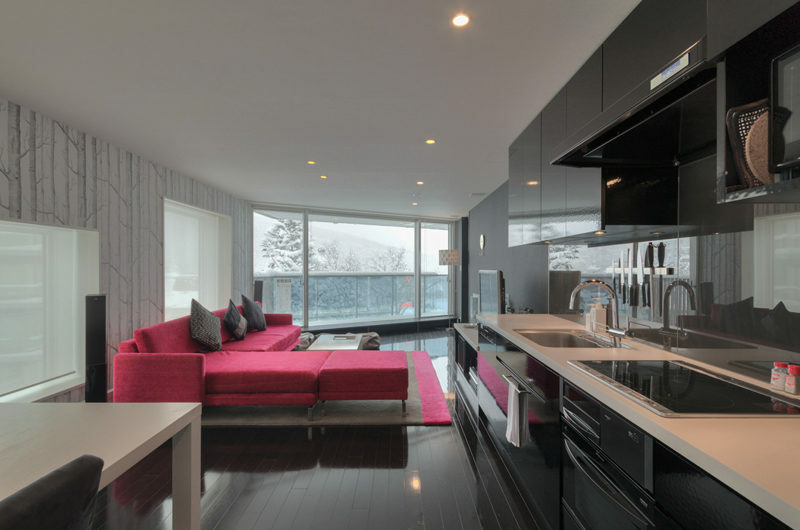 Sprawled across two floors this penthouse gives you the best that Kira Kira Niseko has to offer. 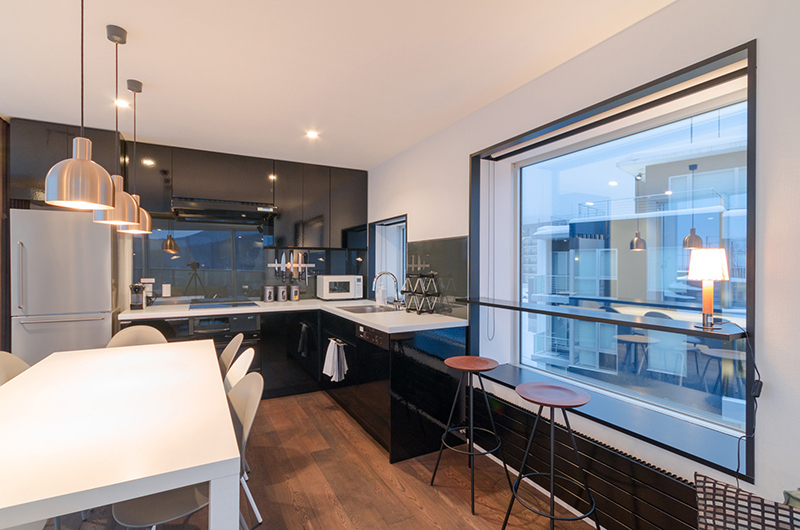 Fully-equipped kitchen, secluded sleeping spaces and top floor open plan living/kitchen space with expansive terrace and hot tub jacuzzi. Upper Hirafu is an eclectic mix of high-rise residentials and shortcuts connecting Hirafu’s hot spots. All the main restaurant, shopping and drinking districts are a short stroll away, giving you easy access to everything you need – while the secluded sidestreet location keeps you away from the noise and bustle. 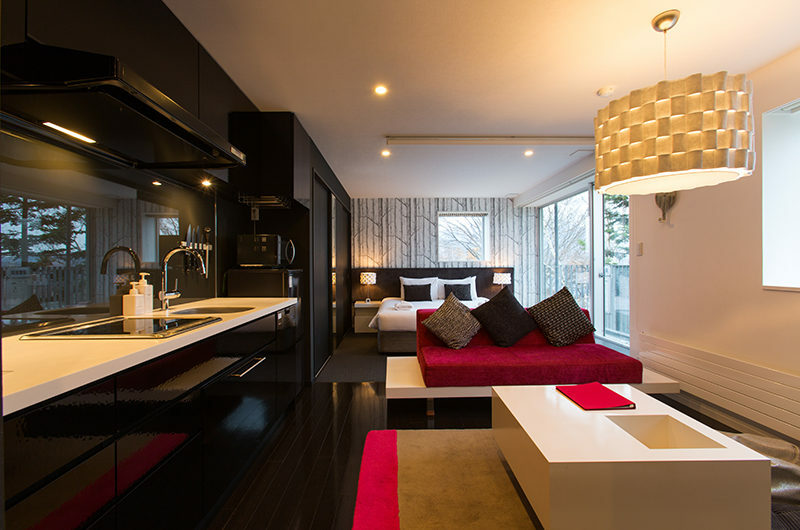 With regular shuttles departing to and from the ski hills, Kira Kira Niseko management should have you sorted for all your powder cravings. To get around catch the village shuttle or main buses to other resorts at the Seicomart less than 10 minutes’ walk downhill. On your return, get off at the Welcome Center and walk back down to Kira Kira Niseko on your return to ensure you never have to face a steep uphill hike. Choose to turn a right and go down-hill to Hirafu’s restaurant district. 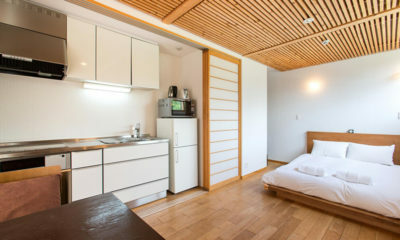 Five minutes will take you to pizzerias, hot pot and fine dining at Kamimura, five more and you can reach the food truck village and seicomart convenience store, or Momiji-zaka restaurant street. Or turn left and walk out to Hirafu-Zaka for some of Hirafu’s most in-demand izakayas, A Bu Cha 2 and Bang Bang. The Hirafu 188 building will cover all your grocery needs at reasonable prices. We stayed with our kids and partners (6 in total) for a week at the end of February/beginning of March and had a fabulous stay. 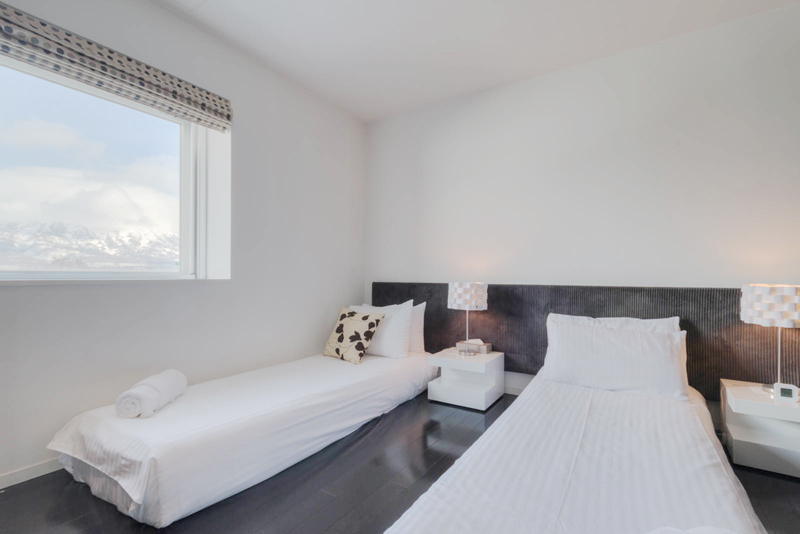 The apartment was light and airy and very well furnished. We didn’t do much cooking but the kitchen was well equipped and we used it for breakfasts. 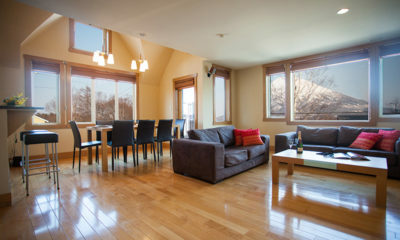 The apartment was in a great location both for access to the slopes as well as access to bars and restaurants. A well stocked supermarket was on the corner of the street. We rented equipment from Niseko Sports (a 2 minute walk away) which we had pre-booked along with transfers, lift passes, lessons etc and the Powderlife team made everything so easy for us. The pre-arrival service was exceptional and Nila was extremely helpful. 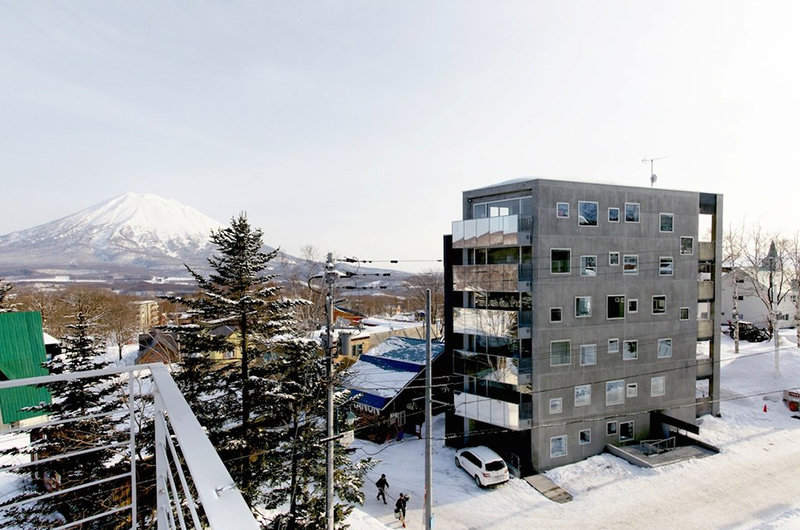 The staff on arrival were equally helpful and we would definitely recommend the combination of Kira Kira apartments and Powderlife if staying in Niseko. 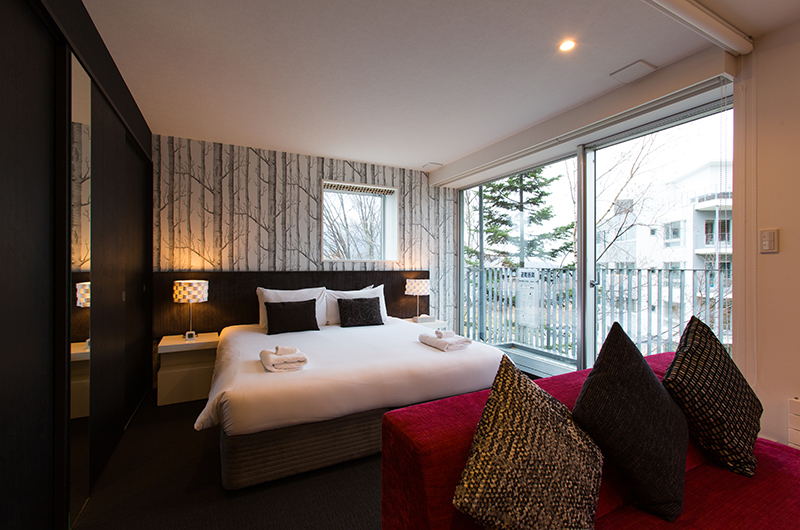 Upper Hirafu had some amazing restaurants and bars and we got some great massages at Niseko Physio! We had some lovely sunny days too which were a bonus. A great fun trip and we will be back! 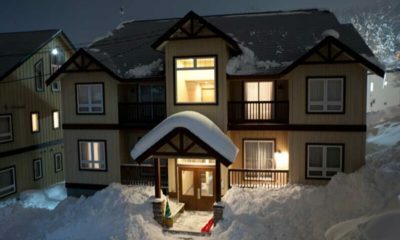 This was our second time to Niseko (first time was 6 years ago). We were a group of 14 made up of 3 families. On each floor there is a 3 bed apartment and a studio apartment, we had the 2nd and 3rd floors for our entire group and it worked brilliantly. 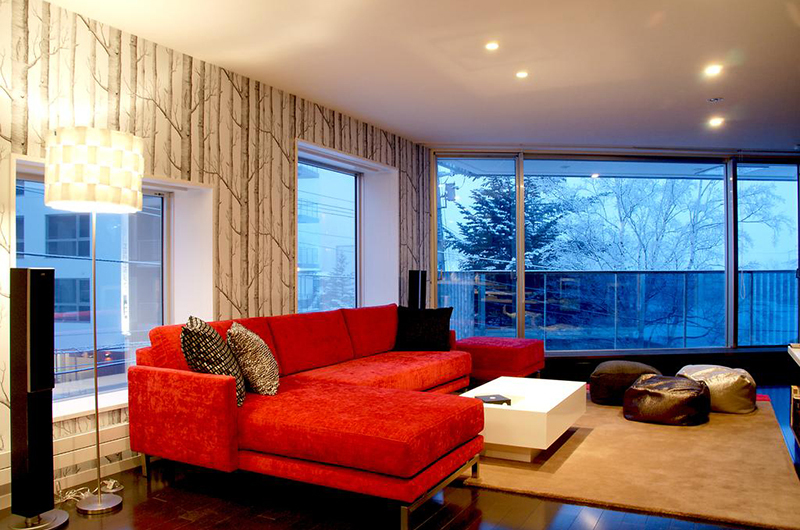 Great basement area for ski and boot storage. The Hokkaido Tracks staff were excellent and organised transfers to and from the lifts each day. You can walk, it’s about 10 mins and uphill, but why walk when there is a mini van available. Hokkaido Tracks staff also pre-booked 4 different restaurants for us and it was great to have these sorted prior to our arrival as being such a large group it can be difficult getting bookings at short notice. 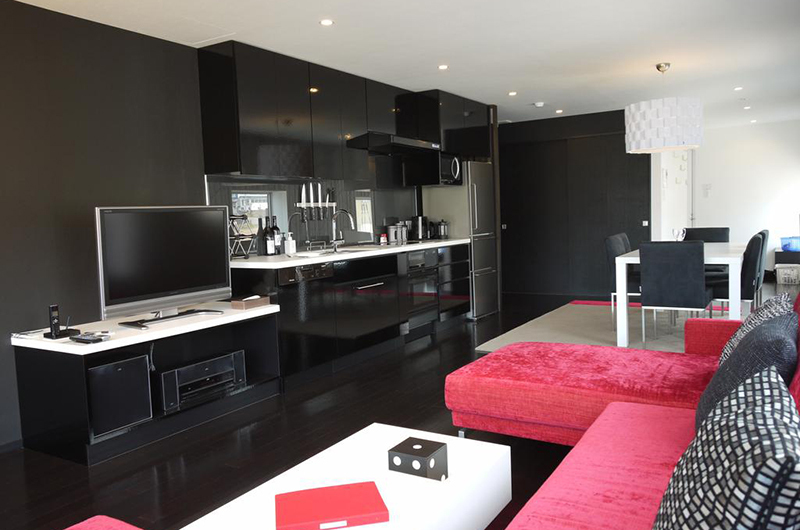 The apartments are quite spacious and well located in the upper village, with no more than a 10 min walk to any of the restaurants or bars. 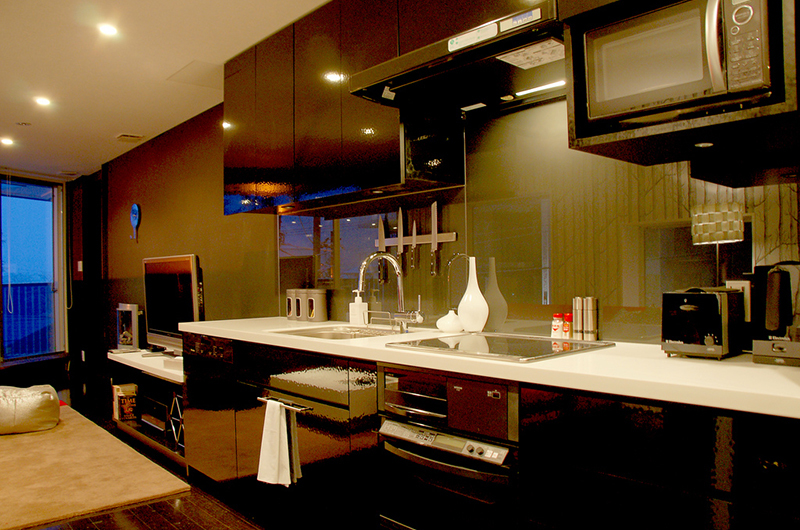 The kitchens are well equipped as are the laundry facilities. Would highly recommend. Stayed there a week from X’mas to New Year. Pretty easy to book online and with most of the essentials prearranged like Lift Pass, Airport Transfers etc. Someone greeted us at the bus stop followed by a prompted check-in. We had a 2 bedroom with the 3 of us, lounge area was large and with good sized bedrooms and ensuite bathroom. 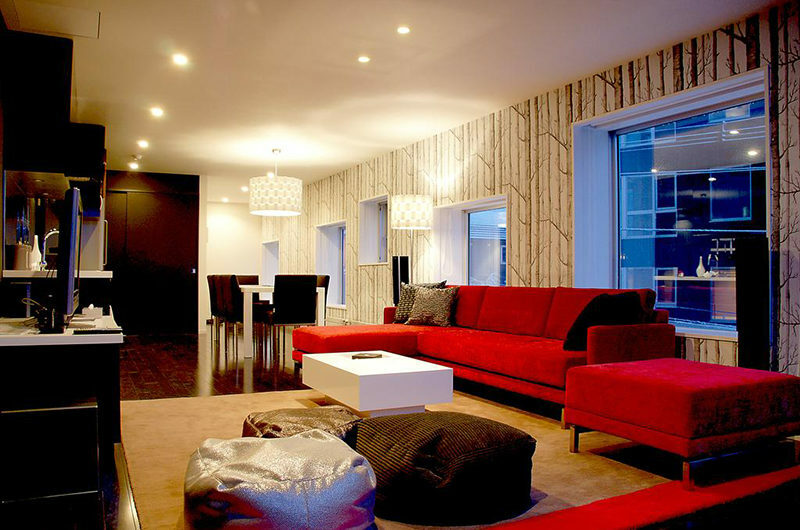 Deco was contemporary and clean. Just around the corner from supermarket; and booking comes with a ski valet at the gondola base which makes the daily commute relatively painless. The only reason why I didn’t rate a 5 star is that i would have prefer they offered some arrangement to give us a lift to the lift area. Niseko United does run buses up and down Hirafu but the queue is generally long during morning and sunset; so we ended up hauling our gear and walked there and back on the first and last day. Not too far of a track, say 15 mins, but with gears on your back, it could be a bit tiring. 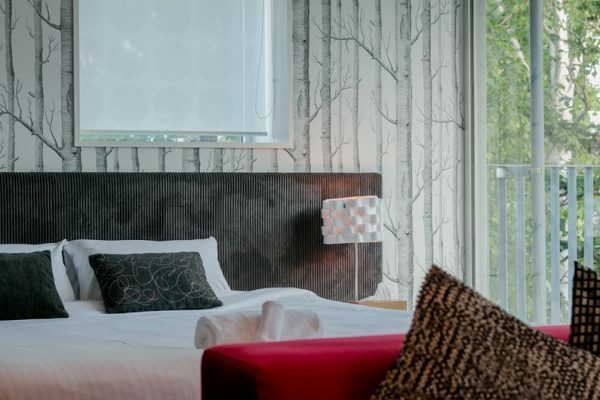 I also would advice traveller to book their restaurants for dinner well in advance, nothing to do with Kira Kira per se, just because of how busy it is in Niseko during peak ski seasons. 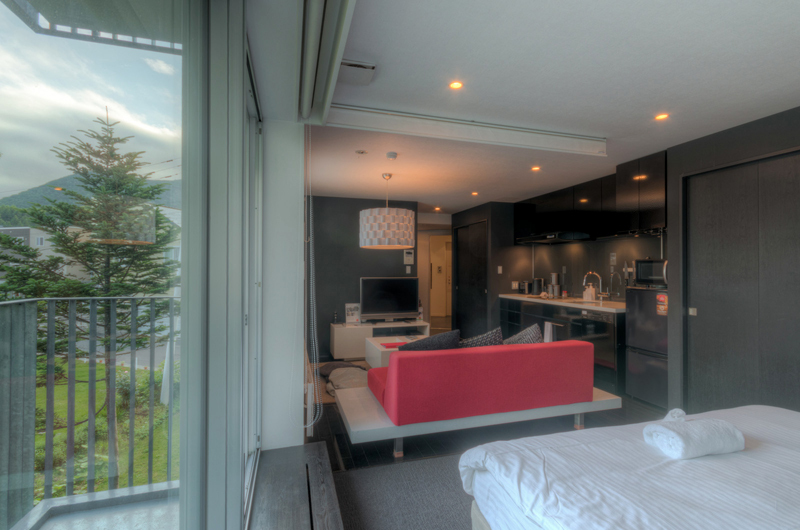 I stayed in the studio apartment with a friend and it was perfect. 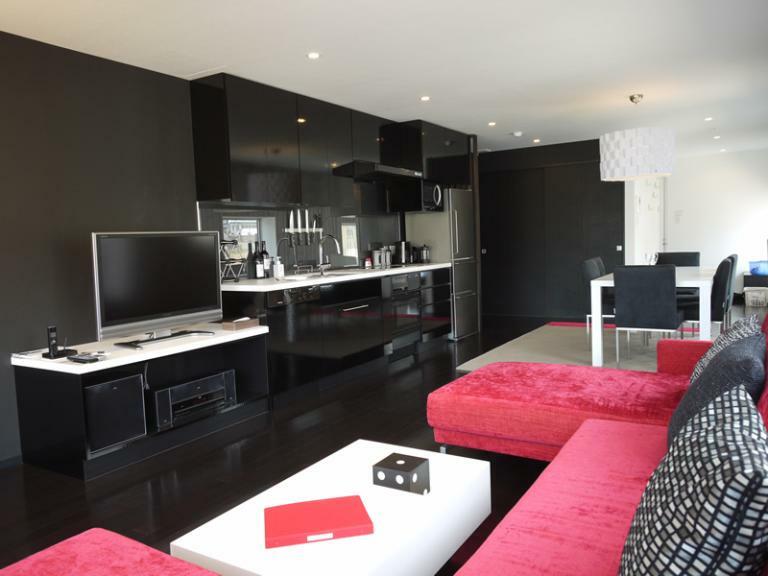 It has a small kitchen, washing machine and very clean. 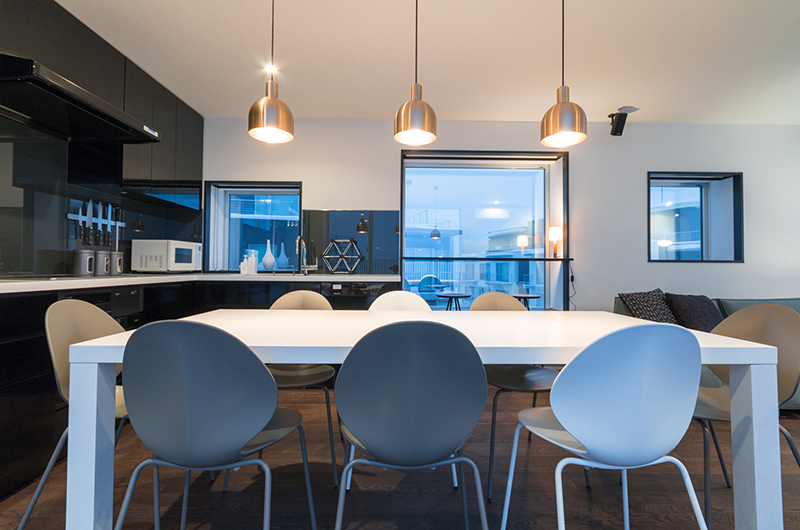 Love the decor, can store my snowboard in the ski room in the basement, very short walking distance to the Ace Family lift, say 5 – 7 minutes. The staffs were very helpful and friendly. There was a small bakery behind the building which serves great scones. 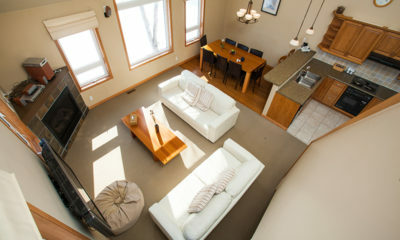 Definitely a great location to stay for couples or families. We are group of a couple plus family of 5 with 3 teenagers. The apartment posh with big living room, good size dining for 8 and a very well equipped and clean kitchen. We had a great time cooking some meals there and with a dish washer that make cleaning easy. The best part of this apartment is the wide balcony with an outdoor Jacuzzi and despite the winter cold its very well insulated with a thick cover when not in use and keep on maintaining temperature of 38degC. Everybody had such a great time at the Jacuzzi especially the guys with the whiskies and beer. Great place to chill out after a day of skiing. 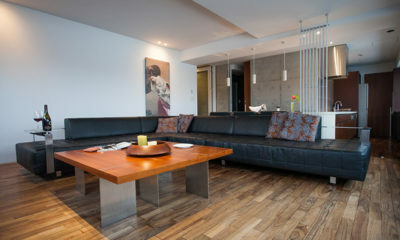 Our unit is 601 a split level Penthouse with one room at the upper floor and 2 rooms downstairs where the entrance is. Elevated stops at 5th floor to enter but going out 6th floor may activate lift to the 6th floor to exit. There’s in house store to keep ski boots and ski. 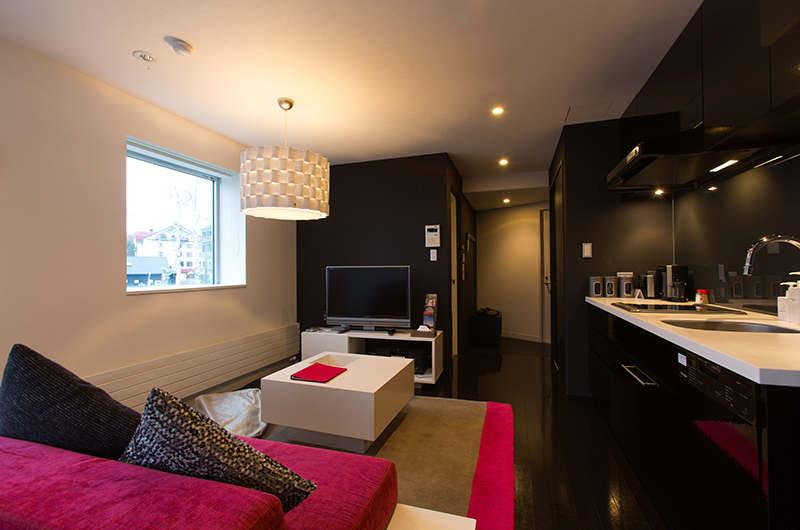 Location is perfect within 150 m to all the great eats and convenience store and bars and to the bus. 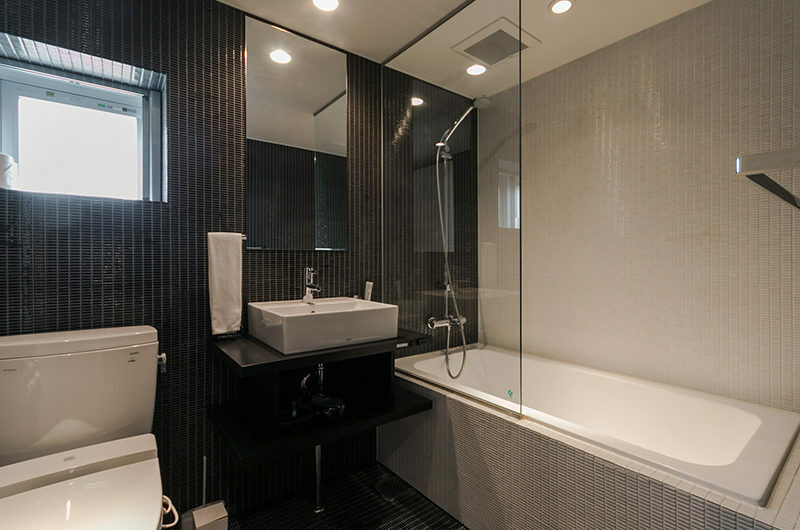 The management is fantastic and proactive fixing the Jacuzzi to be at good temperature even before we arrive. We will surely use HT Holiday for our future bookings. Compared to my previous two experience with another famous operator, HT is way ahead in terms of service. 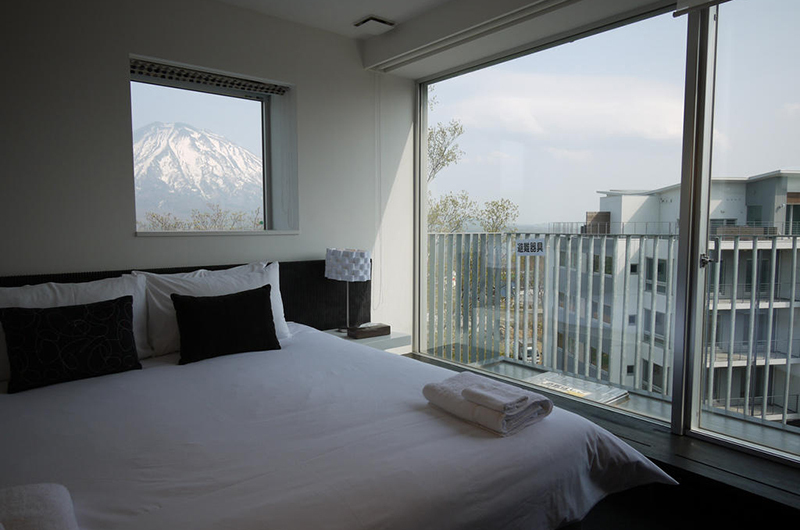 Almost forgot the view at unit 601 is unbelievable facing the Yotei mountain and with a big balcony and glass all around. 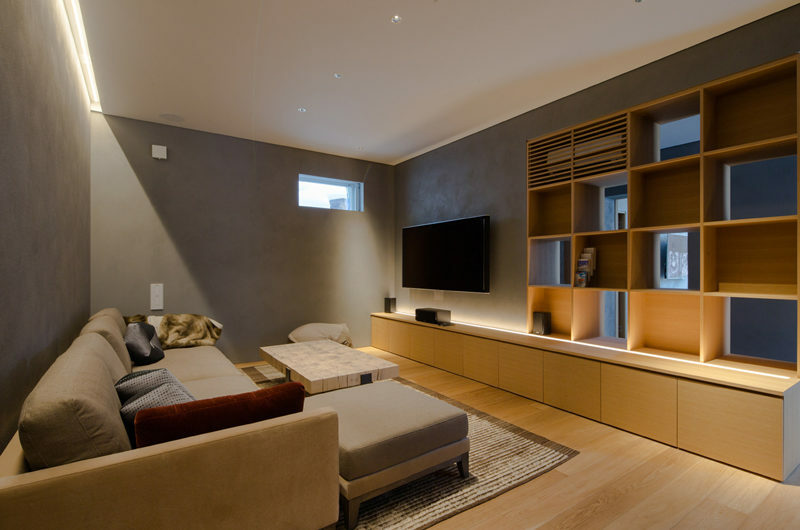 And complete with a nice home theatre and hi fi system.